At a time in history when we are more aware of the environment, we have changed our habits to lessen our impact on it. Reduce, reuse, recycle has been drummed into our collective consciousness. Most of us do what we can to follow these new three R’s, but my husband has embraced this as his personal philosophy. Many a Saturday morning has been spent waiting in line at the county dump on Hazardous Waste Day to drop off broken electronics and paint we’ve accumulated. The compact fluorescent bulbs he has installed in our bathroom are the bane of my existence. I now use the bathroom in semi-darkness while waiting for the lights to reach their full wattage by which time I am usually done doing whatever it is I had gone in there to do. He has called alternative energy companies to have solar panels added to our tree shrouded home only to be disappointed when told it was not a possibility and has joined his company’s “green team” to clean up a nearby nature preserve much to his own poison ivy related peril. There is a glitch in my husband’s environmentally friendly programming. At home, he recycles every scrap of paper or cardboard no matter how small, yet on vacation, this green guy can not walk past a rack of promotional pamphlets and leave empty-handed. I must watch him like a hawk in hotel lobbies, museums and attractions or he will be clutching a fistful of brochures as we walk to the car. It doesn’t matter what the pamphlet is about; he feels compelled to take it. Perhaps he feels there is some vital information being disseminated that we would otherwise never learn about. I don’t know and he can’t explain it. No matter where we are, as each day of our vacation passes, the pile of pamphlets on the desk in our hotel room seems to multiply like rabbits left unsupervised. Because of his indiscriminate brochure snatching, we often have duplicates and triplicates. Inevitably, several days into our trip, that teetering pile becomes the topic of conversation. “Why do we have so many pamphlets on the desk?” I already know the answer. This is just my ice breaker. “Well, was there something useful, like a discount coupon?” I ask. “I don’t know. I haven’t gone through them,” is his standard answer. On our most recent vacation, surrounded by the natural beauty of the Canadian Rockies, I tried a different tactic when I saw the pamphlets proliferating. Hoping to play on his environmental sympathies, I took the eco-angle to this chronic problem. “Yeah, but I thought there might be something additional in the pamphlets that wasn’t in the guide book,” was his reply. “The trees are already dead because the pamphlets have already been printed so how is putting them back going to help the situation?” was his rebuttal. He looked at me as if I was insane, but couldn’t refute my logic. For a day or so the pamphlet pile stopped growing. I felt triumphant. After years of skirmishes I had finally won the pamphlet war. My victory was short-lived. On our final day of vacation we drove to the Athabasca Glacier in Jasper National Park. The glacier has been receding for 150 years and dated signs along the road marking the glacier’s retreat made that fact shockingly graphic. After we hiked up to the glacier and marveled at the size and thickness of the ice, we went to the visitors’ center for a bathroom break before the two hour drive back to Lake Louise. 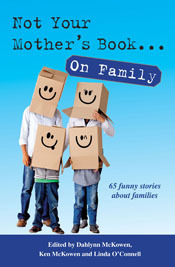 When I emerged from the bathroom, my husband had a pamphlet in his hand and a smile on his face. 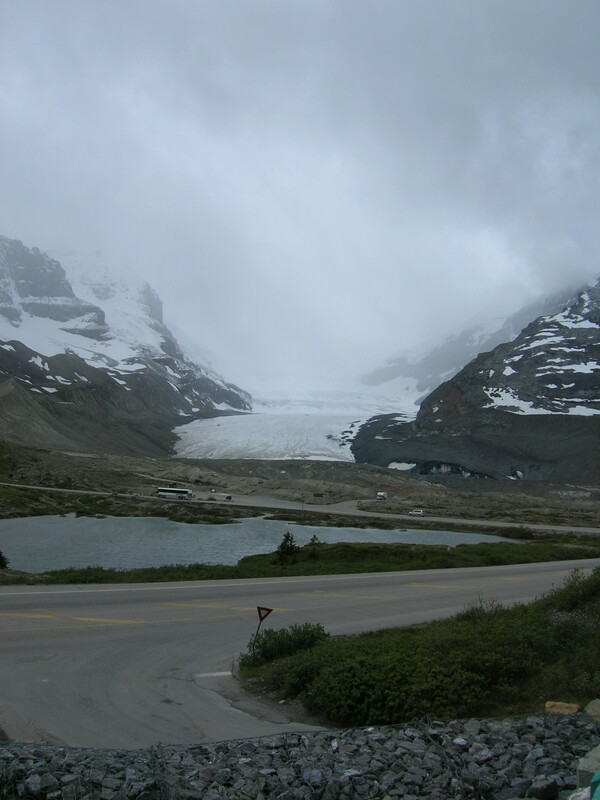 The Athabasca Glacier once covered the area where the road now is. Clearly, this was the pièce de résistance of his pamphlet compulsion. “Did you become fluent in French while I was in the bathroom? You don’t even understand people who speak English with a French accent. Why would you take that pamphlet?” I was dumbfounded. “I can’t read the French, but numbers are numbers and we’ll be able to figure out the rest of it,” he said pointing to measurements listed on the map to prove his point. He had thought this through thoroughly in the five minutes I left him alone. We can't read French, but still my husband couldn't resist a pamphlet. So now their indefinite safe keeping is to become my responsibility? I don’t think so. “Yes, I have a travel file,” I replied, “It’s called the internet.” Obviously, the pamphlet war waged on. The homeless pamphlets remained untouched on the dresser in the spare bedroom with the rest of the post trip detritus: Canadian coins, receipts, ticket stubs and stamps. The weight of the pile combined with the slipperiness of the glossy paper eventually caused an avalanche. I returned the items to their tidy mound only to have the papers slip and slide each time I passed by. Restacking this odd assemblage of paper was not a chore I was eager to add to my daily routine so I asked my husband if he had determined a final resting place for his collection. He said nothing, but when I awoke the next morning, the pile was missing. My elation at the pamphlets’ disappearance quickly turned to disappointment when I found them neatly stacked on a different dresser in a different room. Knowing my husband didn’t have the heart to dispose of them, I took matters into my own hands. I carefully sifted through the hoarded pamphlets, removed the duplicates and those from places we had never visited and put the remnants back the way I had found them. I hoped he’d be none the wiser to my thinning of the herd. CAUGHT! I said nothing and just looked sheepishly at him. “Well, did you at least recycle them?” he asked. Posted in Uncategorized and tagged Athabasca Glacier, global warming, humor, Jasper National Park, recycling, travel humor. Bookmark the permalink. Just wandering around today (thinking it must be vacation time soooon) We hve the same problem with brochures – at least the internet has helped eliminate some of the paper pick-ups! I was so relieved when the park service started having those “recycle your maps/ brochures here” boxes. Just so much easier now…dealing with the compulsion…at least less guilt if we can drop them back off. Thanks for the chuckles! That’s great that the park service has brochure and map recycling bins. I still don’t think I’d be able to get Oregano to part with this beloved papers though. We might NEED something and then where would we be? Thanks for reading and chuckling. Have fun planning your vacation. Another good humored perspective of your adventures! Loved it! Thanks! Great commentary on both traveling and the “fun” of traveling with others. As a former hoarder of pamphlet paraphernalia, I can certainly relate to your husband’s attraction to the glossy giveaways. On our numerous trips to Cape May I’ve gathered quite a collection, which I’ve been able to use in some classroom activities. Of course, much of my gatherings have mysteriously disappeared, victims, I’m sure, of my wife’s own recycling plan. Don’t try to rationalize your pamphlet addiction with their usefulness in your classroom 🙂 At least you and Oregano are keeping the pamphlet printers in business.